I can live without a lot of the trappings of Christmas. Every year I come down with a bad case of tinsellitis. The commercial fuss is overbearing. The enforced fun quickly becomes unappealing. The reason for the season seems distant until a moment every December when something about the Christmas story catches me unawares. One year it was the genuinely candlelit nine lessons and carols at Westbourne Presbyterian where a power cut had taken out the lighting circuit leaving the congregation to light up the service with their voices and readings. Another time it was a Friday lunchtime in the foyer of a local broadcaster and hearing the gathered staff gustily sing the words of carols first drummed into me at primary school. There’s something about the words of carols, the act of communal singing, listening to the Bible readings or watching them being acted out that draws me back from my Grinch-like attitude to the wonder of the Christmas story. But how well do the lyrics of the much-loved seasonal songs represent the biblical narratives of the birth of Christ? 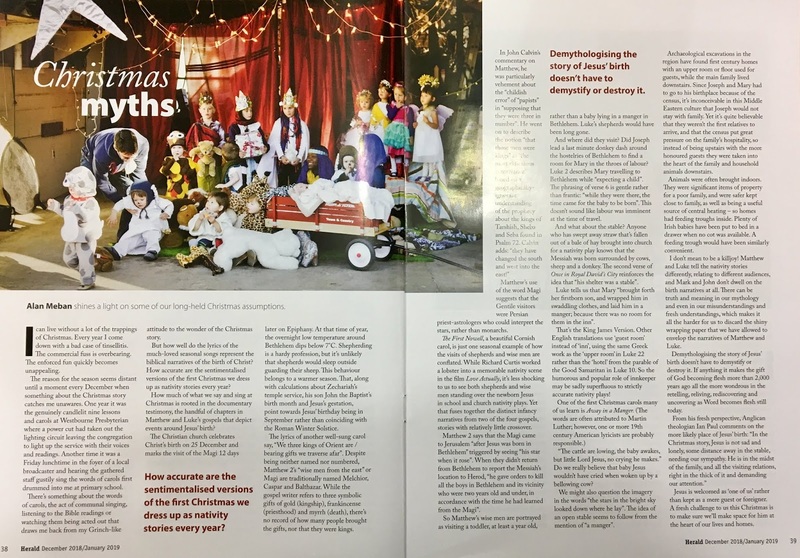 How accurate are the sentimentalised versions of the first Christmas we dress up as nativity stories every year? Fact checking organisations are busy all year round validating claims made by politicians, press and public. I’m involved behind-the-scenes at the FactCheckNI organisation, but I don’t think that we, or our Irish equivalent TheJournal.ie, has ever been asked to fact check Christmas. Perhaps that’s just as well, as some of the portrayals wouldn’t stand up to close scrutiny. How much of what we say and sing at Christmas is rooted in the documentary testimony, the handful of chapters in Matthew and Luke’s gospels that depict events around Jesus’ birth? The Christian church celebrates Christ’s birth on 25 December and marks the visit of the Magi 12 days later on Epiphany. At that time of year, the overnight low temperature around Bethlehem dips below 7°C. Shepherding is a hardy profession, but it’s unlikely that shepherds would sleep outside guarding their sheep. This behaviour belongs to a warmer season. That, along with calculations about Zechariah’s temple service, his son John the Baptist’s birth month and Jesus’s gestation, point towards Jesus’ birthday being in September rather than coinciding with the Roman Winter Solstice. Oddly, the dubious month was the only aspect of Christmas that I remember being debunked by primary school teachers. Everything else was wholly unquestioned. The lyrics of a well-sung carol say “We three kings of Orient are / bearing gifts we traverse afar”. Despite being neither named nor numbered, Matthew 2’s “wise men from the east” or Magi are traditionally named Melchior, Caspar and Balthazar. While the Gospel writer refers to three symbolic gifts of gold (kingship), frankincense (priesthood) and myrrh (death), there’s no record of how many people brought the gifts, nor that they were kings. Matthew’s use of the word Magi suggests that the Gentile visitors were Persian priest-astrologers who could interpret the stars rather than monarchs. The First Nowell, a beautiful Cornish carol, is just one seasonal example of how the visits of shepherds and wise men are conflated. While Richard Curtis worked a lobster into a memorable nativity scene in the film Love Actually, it’s less shocking to us to see both shepherds and wise men standing over the new born Jesus in school and church nativity plays. Yet that fuses together the distinct infancy narratives from two of the four Gospels, stories with relatively little crossover. Matthew 2 says that the Magi came to Jerusalem “after Jesus was born in Bethlehem” triggered by seeing “his star when it rose”. When they didn’t return from Bethlehem to report the Messiah’s location to Herod, “he gave orders to kill all the boys in Bethlehem and its vicinity who were two years old and under, in accordance with the time he had learned from the Magi”. So Matthew’s wise men are portrayed as visiting a toddler at least a year old, rather than a baby lying in a manger in Bethlehem. Luke’s shepherds would have been long gone. And where did they visit? Did Joseph lead a last minute donkey dash around the hostelries of Bethlehem to find a room for Mary in the throes of labour? Luke 2 describes Mary travelling to Bethlehem while “expecting a child”. The phrasing of verse 6 is gentle rather than frantic: “while they were there, the time came for the baby to be born”. This doesn’t sound like labour was imminent at the time of travel. And what about the stable? Anyone who has swept away straw that’s fallen out of a bale of hay brought into church for a nativity play knows that the Messiah was born surrounded by cows, sheep and a donkey. The second verse of Once in Royal David’s City reinforces the idea that “his shelter was a stable”. Luke tells us that Mary “brought forth her firstborn son, and wrapped him in swaddling clothes, and laid him in a manger; because there was no room for them in the inn”. That’s the King James Version. Other English translations use ‘guest room’ instead of ‘inn’, using the same Greek work as the ‘upper room’ in Luke 22 rather than the ‘hotel’ from the parable of the Good Samaritan in Luke 10. So the humorous and popular role of innkeeper may be sadly superfluous to strictly accurate nativity plays! “The cattle are lowing, the baby awakes, but little Lord Jesus, no crying he makes.” Do we really believe that baby Jesus wouldn’t have cried when woken up by a bellowing cow? We might also question the imagery in the words “the stars in the bright sky looked down where he lay”. The idea of an open stable seems to follow from the mention of “a manger”. Archaeological excavations in the region have found first century homes with an upper room or floor used for guests, while the main family lived downstairs. Since Joseph and Mary had to go to his birthplace because of the census, it’s inconceivable in this middle eastern culture that Joseph would not stay with family. Yet it’s quite believable that they weren’t the first relatives to arrive, and that the census put great pressure on the family’s hospitality, so instead of being upstairs with the more honoured guests they were taken into the heart of the family and household animals downstairs. Animals were often brought indoors. They were significant items of property for a poor family, and were safer kept close to family, as well as being a useful source of central heating – so homes had feeding troughs inside. Plenty of Irish babies have been put to bed in a drawer when no cot was available. A feeding trough would have been similarly convenient. I don’t mean to be a killjoy! Matthew and Luke tell the nativity stories differently, relating to different audiences, and Mark and John don’t dwell on the birth narratives at all. There can be truth and meaning in our mythology and even in our misunderstandings and fresh understandings, which makes it all the harder for us to discard the shiny wrapping paper that we have allowed to envelop the narratives of Matthew and Luke. 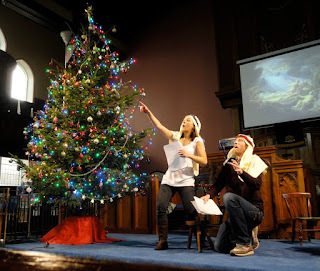 Demythologising the story of Jesus’ birth doesn’t have to demystify or destroy it. If anything it makes the gift of God becoming flesh more than 2,000 years ago all the more wondrous in the retelling, reliving, rediscovering and uncovering as Word becomes flesh still today. Jesus is welcomed as ‘one of us’ rather than kept as a mere guest or foreigner. A fresh challenge to us this Christmas to make sure we’ll make space for him at the heart of our lives and homes. 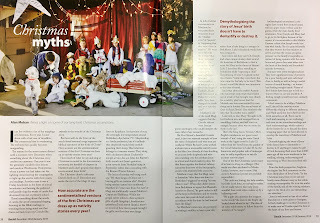 This article appeared in the December/January edition of the Presbyterian Herald magazine.